You may have noticed this last week that we redesigned and re-launched our website. We’re fairly proud of our new design and hope it makes things easier for you to find the best dog related stories, and the latest dog news. In a further move to make our doggie content more accessible for people we’ve joined two of the biggest social networking websites, Facebook and Twitter. You’re now able to become a ‘fan’ of Dream Dogs on Facebook and follow us on Twitter so that you can get your latest dog news even quicker than before. 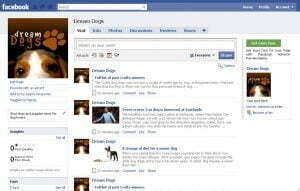 By becoming a fan of our Facebook page you can get daily dog news and dog care tips direct to your Facebook page – without needing to visit our website. If you’re an avid Twitter user you can follow us on Twitter here and see our daily blog posts ‘tweeted’ for your benefit – as well as some extra special Tweets from our dog care expert Vivien. Do let is know if you’re a Facebook user or a Twitter fan – and what you think of the new design.